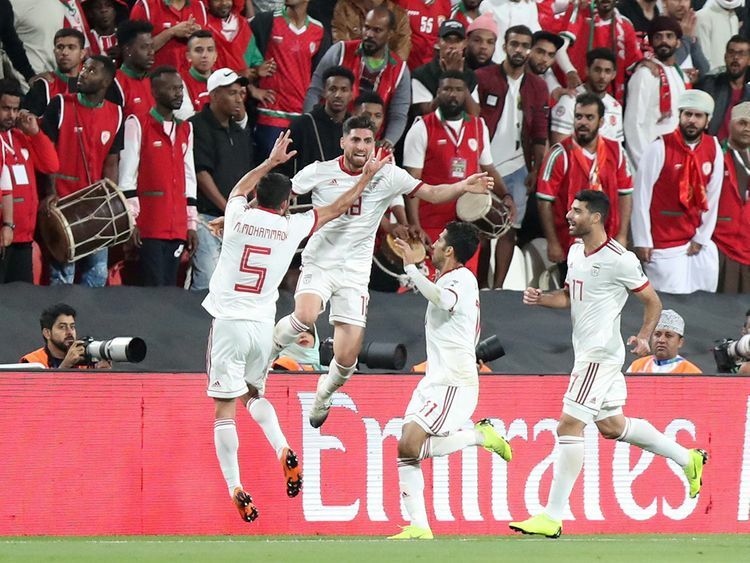 Abu Dhabi: Three-time champions Iran defeated Oman 2-0 to storm into the quarter-finals of the AFC Asian Cup at the Mohammad Bin Zayed Stadium on Sunday. Both goals came in the first half and were scored by Alireza Jahanbakhsh and Ashkan Dejagah. Iran with this win have an opportunity to breaking their jinx as they have not won an Asian Cup knockout game since 2004, losing at the quarter-final stage in each of the last three tournaments. Less than a minute into play and Oman missed out on a great opportunity after Muhsen Al Ghassani drew a penalty from the first move. Iran’s Seyed Majid Hosseini tripped Al Ghassani from behind and the referee pointed it out to the spot. However, Iran goalkeeper Ali Reza Safarbeiranvand judged the effort from Oman captain Ahmad Al Mahaijri to perfection and made a diving save to his right. That escape was enough for Iran to get their acts together and they were dominant thereafter. The breakthrough for Iran came in the 32nd minute. Jahanbakhsh poked the ball home following a defensive lapse from Oman’s Mohammad Al Musallami. Iran then went on to make it 2-0 before half-time. Oman’s Saad Al Mukhaini went for a needless tackle from behind on Mehdi Taremi and the resultant penalty was converted with ease by captain Dejagah. Iran maintained the pressure even after the change of ends. In the 55th minute a full-blooded effort from Taremi was kept out by Oman goalkeeper Faiyz Al Rusheidi. Taremi was again denied in the 83rd minute by Al Rusheidi but Iran then held on to their two goal edge until the final whistle.